What do your Mountain People look like? Haven't played yet, just kind of stumbled upon DitV, but I'm looking into getting as familiar with the setting and rules as I can until I can run a game of my own. I'm particularly interested in what Mountain People in your game look like? I imagine they're based off of Native Americans. In those days, "indians" elicited savage descriptions. In our society, Native Americans have been kind of romanticized and describing the Mountain People as such wouldn't bring the same sort of perception as I'd be wanting from the players. So, what about in your game? Re: What do your Mountain People look like? There isn't one answer to this, as different groups (and individuals) of Mountain Folk have looked different in different situations and campaigns. In general, however, the Mountain Folk the PCs interact with the most often look more or less like the other Faithful, but maybe with slightly darker coloring. That's just because most of my Mountain Folk have been Faithful converts (either themselves or hereditary) and live in, or on the edges, of Faithful communities. So they wear the same clothes, talk (mostly) the same, and generally are only different when there is something social going on in the town. Like one town where the Mountain Folk faithful were all threadbare in their dress, as the local false priesthood was pretty hell bent on exploiting their labor and using them to improve the standard of living of the "real Faithful." Once or twice I've had non-converted Mountain Folk encounter the PCs. One of them looked exactly like this guy: http://en.wikipedia.org/wiki/File:Chief_winnemucca.jpg. 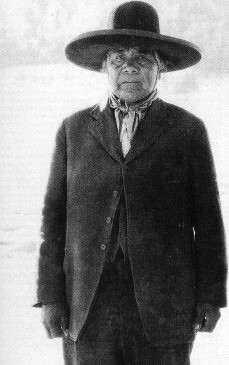 The others looked either like this guy http://upload.wikimedia.org/wikipedia/commons/a/a0/Wovoka_Paiute_Shaman.jpg or this woman: http://upload.wikimedia.org/wikipedia/commons/d/d6/Sarah_Winnemucca.jpg. My Mountain People look like Native Americans. The communities outside the Faith dress "trad" for the most part; the ones inside the Faith dress like other Faithful. I avoid the problem of portraying them as savage or overly romanticized by not portraying them as savage or overly romanticized. I think the design of Dogs can really help here because when I do what the text tells me, I get people with agendas and spend my time having them pursue their agendas. ("Actively reveal the town in play.") If I put Mountain People in a town writeup, I get Mountain People who have agency: particular wants and needs, and the capacity to pursue their ends.